That's what is required for my newest project. 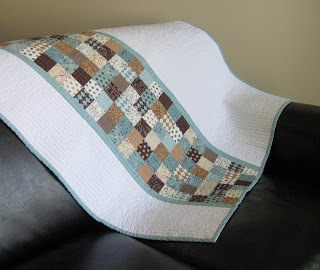 I modified a pattern by Cluck Cluck Sew which you can find here. 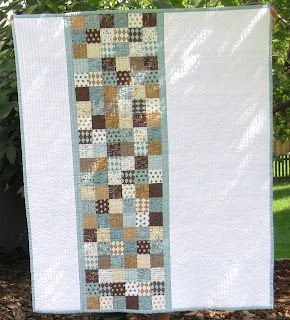 My version starts with larger blocks (10 and 8.5 inches respectively), and I'll be making more - 80 to be exact! That requires a lot of fabric!! 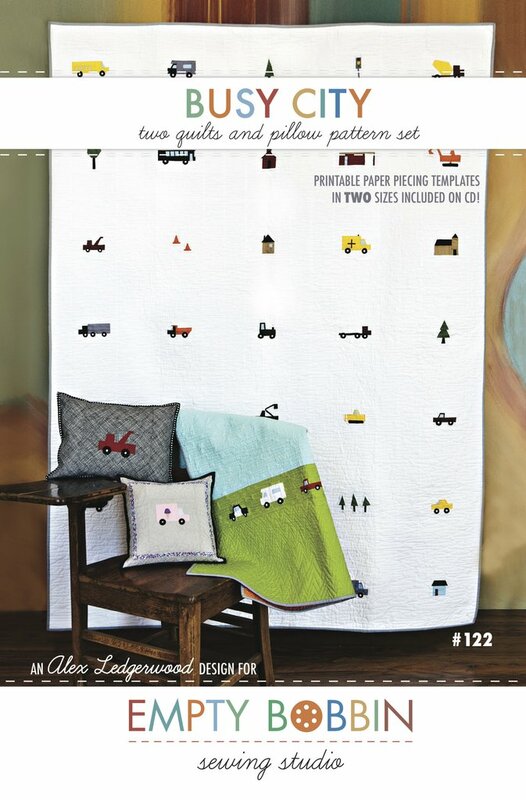 You can see now why I needed the Peas and Carrots and other prints by American Jane. They were just so cute in the original, I had to find some! I also used some full moon dots by Amy Butler, and Make Life from a layer cake, plus various prints from my stash. I tried to stick to boy-friendly prints and avoided all florals. 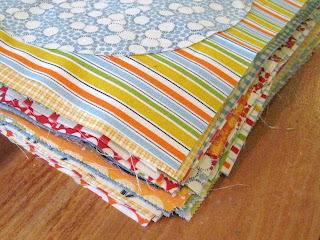 FYI, I found fat quarters to be an inefficient cut to use for this project, given the size blocks I needed. 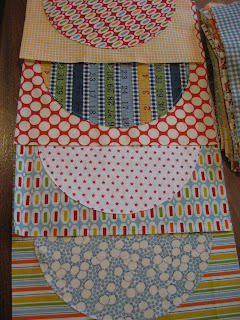 Half yards worked much better with less waste. 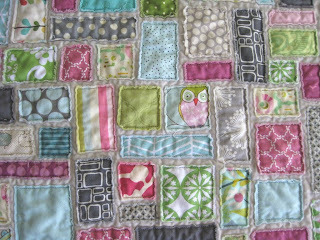 Cutting the blocks and the circles took the longest, while sewing the circles onto the squares was a snap. 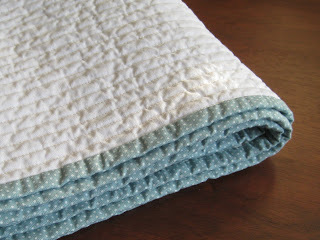 The plan is to make a twin sized quilt for my younger son. This is a long term commitment because these 80 blocks are only the start. 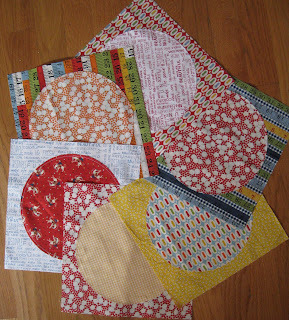 Next I will cut them into quarters, mix them up and sew them back together. That will be 320 little blocks to put together again. I hope, for a lot of reasons, that it's a long time before my little guy is ready for a big boy bed! 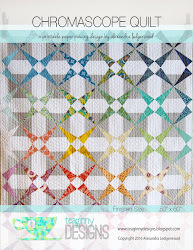 I wanted to try a slightly edgier color scheme for my most recent tickertape doll quilt (for more info on this type of quilt see my previous post). I saw this on flickr using green, gray, and pink. I added some aqua and - perfect! I used a light gray for the backround on the front and charcoal for the back. 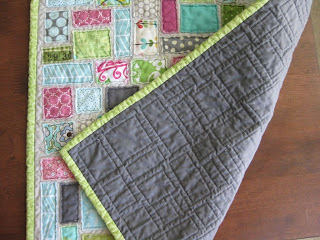 I love how the lime binding looks against the dark gray. All these tickertape quilts have lead to a slight problem, however. 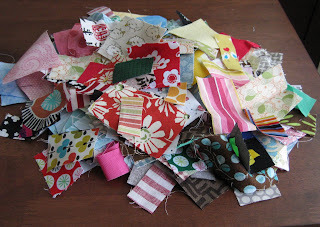 I can't get rid of the tiniest scraps, because I know, of course, they could be made into a tickertape! They are beginning to take over. Want to try making a tickertape yourself, but don't have a variety of scraps to use or perhaps you don't want to cut tons of tiny rectangles and squares out of larger scraps? You are welcome to the mine - just the be the first to ask in the comments and I'll send them to you. *Update: the scraps have been claimed :). 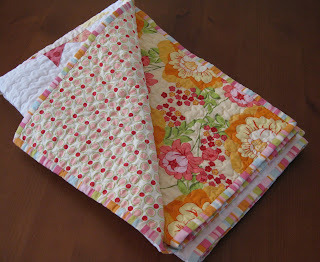 I couldn't believe it when I scored this amazing Peas and Carrots yardage on a certain auction site recently. I was virtually unopposed and got it a super reasonable price, considering it is out of print and very hard to find. Don't you love the multi colored pez prints! Much of it is destined for a new project (a whole other post on that soon! ), but I'm sharing the rest in my etsy shop. 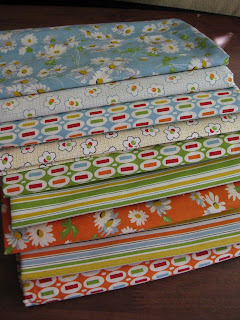 I don't want to become a fabric hoarder. I think it should be used! **Update, only one print left. One yard of the blue fruits (second from the top in the picture) is still available. Here's what's been keeping me so busy the past couple of weeks - my first design for Moda Bake Shop. 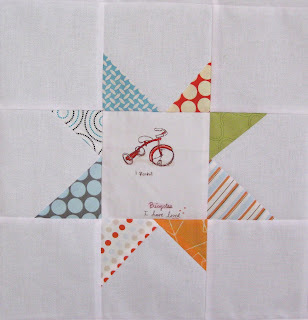 Head on over for a free tutorial to make your own simple, modern baby quilt. 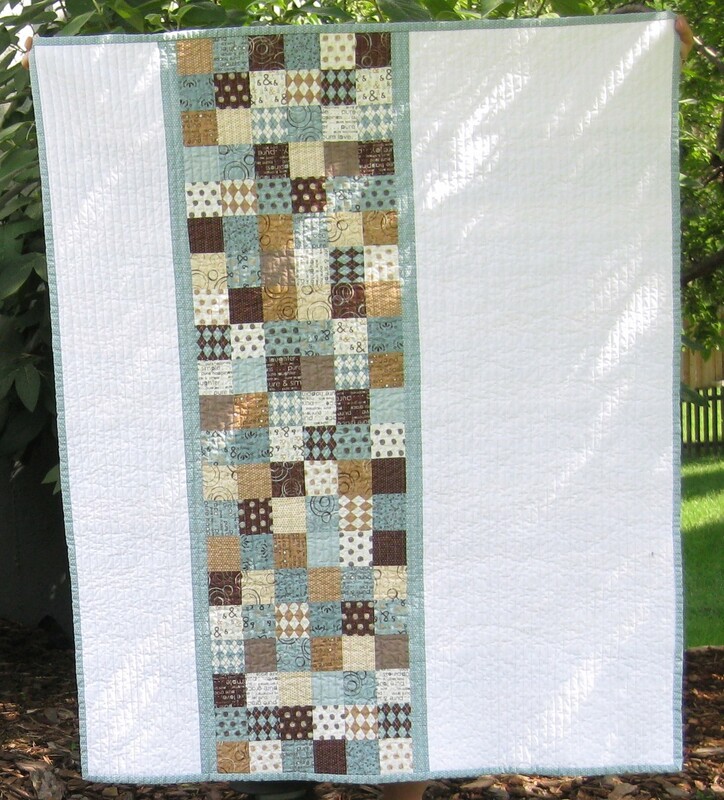 It makes good use of a jelly roll and just 1 3/4 yards of other fabric, so you can create an affordable gift. 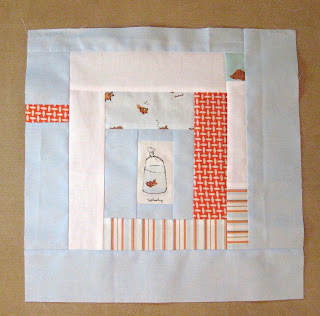 It is also put together using strip piecing, so it's super quick. 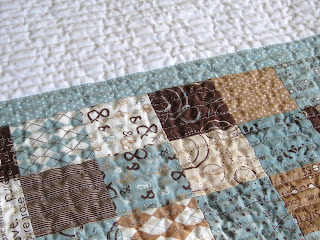 Above is a closeup of the back - also strip pieced. 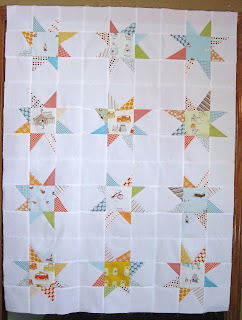 I think it would be gorgeous as a scrap quilt - hmmm...I know so, since I've already pieced it! I'm going to make this one extra special with hand quilting with perle cotton. 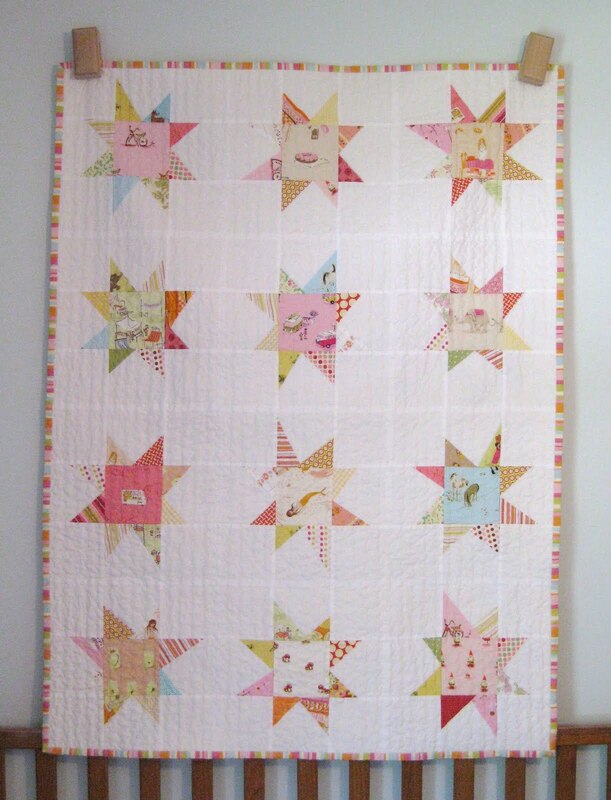 I finished my first star quilt - I'm calling it Summer Sorbet, one of the many great suggestions I received from you all. 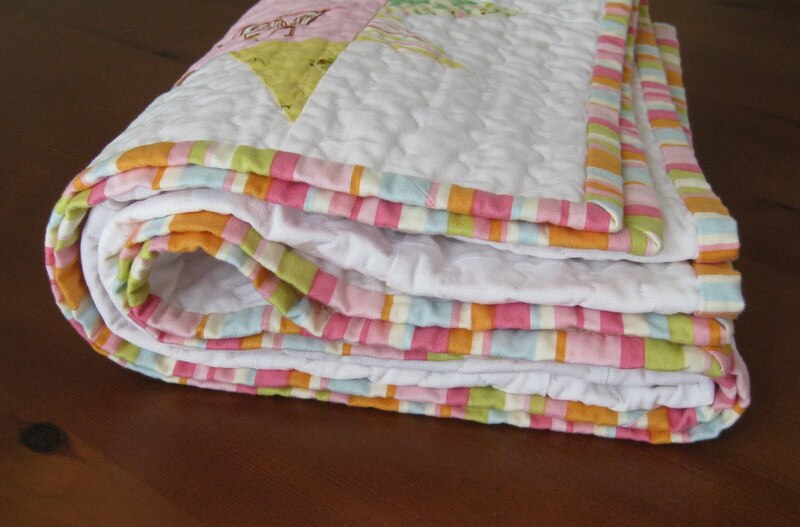 I love how soft the colors and fabrics feel. It is 36 x 48. Part of what has kept me away from my blog was finding the perfect binding and backing to finish off this lovely, girly quilt. 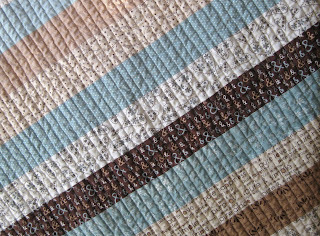 I found this stripe from Michael Miller, and I can't believe how exactly it matches the colors in the front of the quilt! 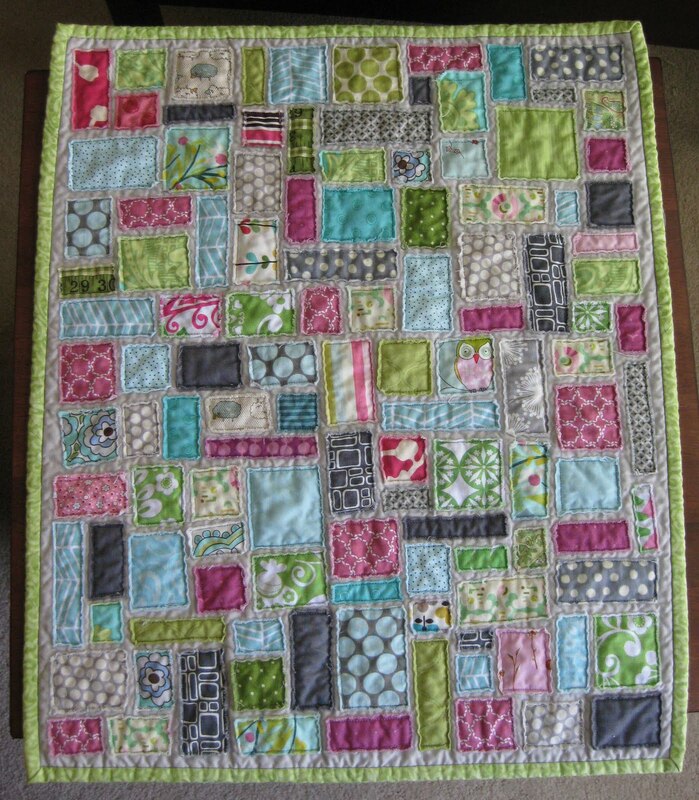 I used the same allover quilting I used with my nephew's quilt, and I like how it sort of disappears to allow the fabrics to shine. 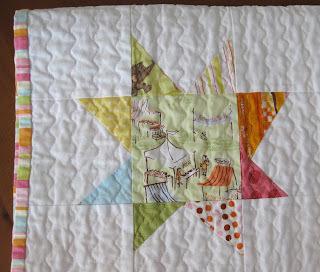 Sandi Henderson's Meadowsweet is so lovely, I just used two prints from the line on the back of the quilt. So bold and fresh! Another project has been keeping me busy, and I'll be able to share it with you on Friday! My quilt guild, the KCMQG, is working on a charity project - 15-20 quilts for the NICU at a local hospital. I have two friends who are NICU nurses, and they have both said that there is always a need for handmade items for the tiny people they serve. In fact, there are never enough special things to go around. That, along with the fact that my younger son was in the NICU for two months after birth, makes me very excited to contribute to this project. 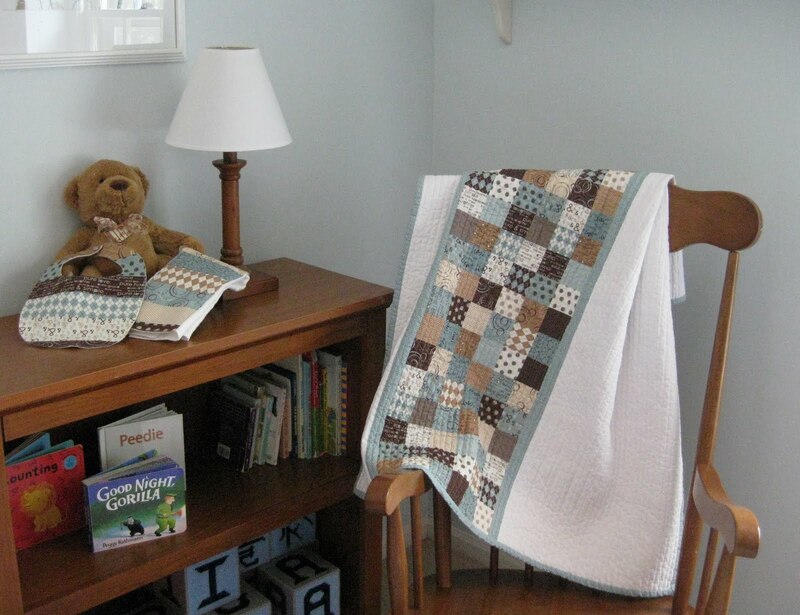 The assignments were color specific, and we were told to make square in a square or improvised log cabin blocks. 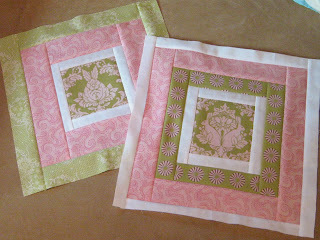 I made two pink and green blocks using some great Hushabye and Full Moon Forest I was able to find (at Tula Pink's mom's store no less!!). 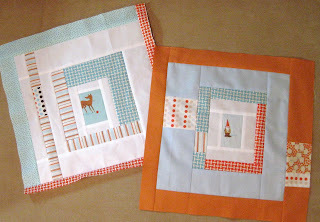 And here are the orange and blue blocks. 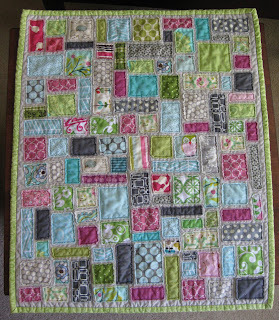 I used up some of my Heather Ross scraps from past projects :). 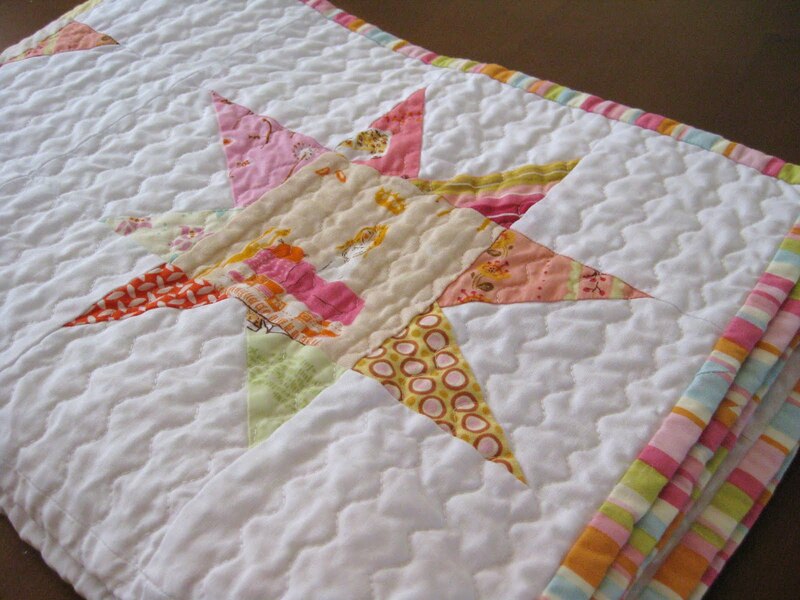 I've had so many great suggestions for names for the girl quilt of this pair (thank you - I'm really bad at naming quilts! 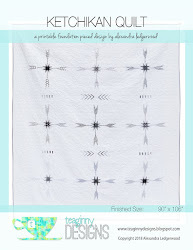 ), and I like how Citric Sugar's ideas for the names of both quilts go together :). I'll ponder my options. Here is the completed boy top. I like how the knome looks like he's getting ready to load the van with mushrooms.